Simple and effective 5-point support harness which fits most single or bench seats in both bus and car. 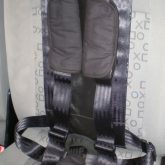 Attaches to vehicle seat with vertical straps, the passenger is then seated and the harness closes to the front. 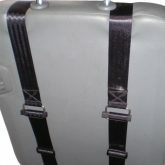 Normally supplied with the ‘Steel Safety Buckle’ which requires 2 actions to open and therefore is more suitable for passengers with challenging behaviour. Can be moved easily from vehicle to vehicle. 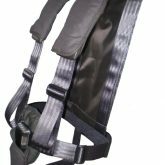 The M28 harness support is ideal for organisations and private use. • Fits most single or bench type seats. • Buckles to front of wearer. • Fits Junior up to adult size. • Available with standard or steel safety buckles. • Chest cross strap option. 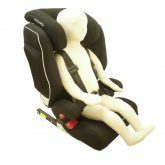 The M28 Harness can be used in booster seats for children from 15kg up to 36kg. Note: Harness systems do not replace the vehicle seatbelt. 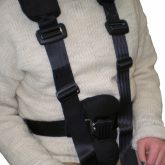 Vehicles own seatbelt must always be used in conjunction with harness supports.